Retracing our steps, working our way back to Paro over the course of the next three days, we had a chance to shop, check our email, reflect and regroup in now familiar Thimpu. Our official meetings were finished, but there was still work to be done. The drive back between Punakha and Thimpu could not have been more different from our previous summit days before. 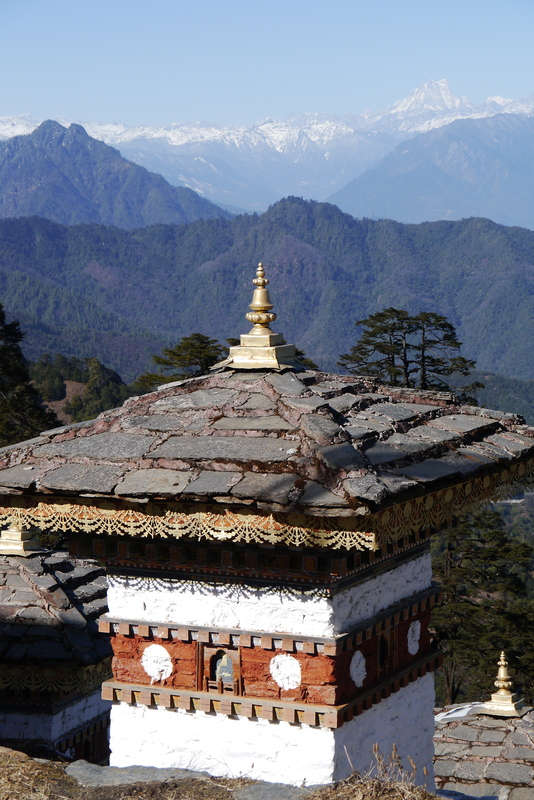 This time the sky was blue and, as we reached Dochula we had a 360 degree view of the Himalayas all around us. 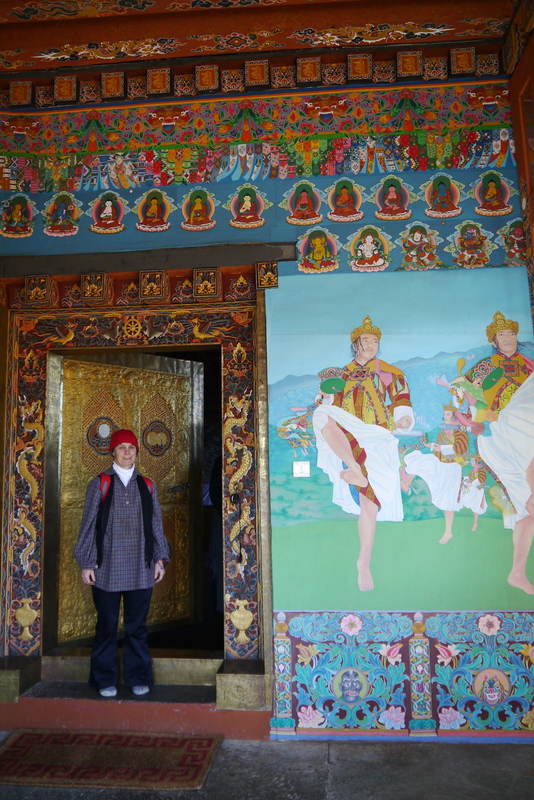 As we waited for the pass to open, we explored the 108 chortens build by the Queen mother commemorating those lost in a brief skirmish with India in 2003 as well as the temple built in honor of the 4th Druk Gyalpo which contained paintings by Karma Ura. 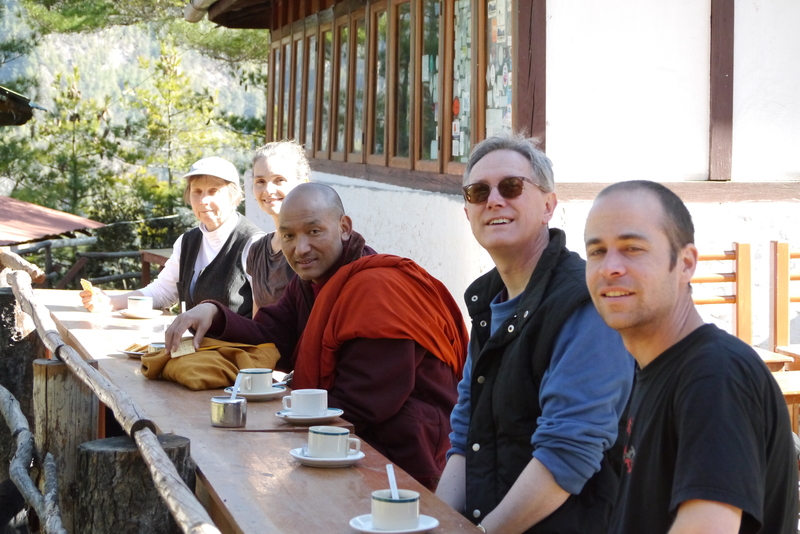 Returning to where it all began outside Paro, on our last day we climbed to Tiger’s Nest. At my regular pace it would have taken about an hour, but for our group it took three. Slowly we ascended, savoring the now comfortable conversation as much as the view. I worked consciously not to make the destination the whole goal as we meandered our way up, catching glimpses of Takshang on a competing peak across the deep divide. After finally reaching Takshang’s elevation, the path turns toward the mountain face and one must descend hundreds of steps only to climb back up to the final destination perched impossibly on the cliff above. Dedicated to Guru Padmasambhava Rimpoche the tantric mystic who brought Buddhism to Bhutan and who flew on a tigress and landed on that sacred spot that is said to resemble a dagger, Takshang defies all reason. To build the foundation, Regent Tenzin Rabgye mixed hair with flour and water and tossed it out. Where it stuck, they placed small stones, then larger and larger stones on top until the foundation emerged. Despite two significant fires in the 20th century that destroyed documents and most of the temples, the foundation and the statue of Guru Padmasambhava Rimpoche survived unharmed. Taksang was rebuilt upon the original foundation. Inside Taksang, the new Abbot welcomed and served us tea and biscuits before giving us a personal tour of several of the 11 temples, two of which are closed to outsiders because visitors might bring bad omens and cause harm. The primary temple is built around an auspicious and powerful cave that is accessible only to the most senior of monks and only at certain times of the year. The rest of the time an imposing face festooned with offerings blocks the entrance. In this temple, those who have powers charge the place while others receive. We sat before the statue in a light filled temple as many, many pilgrims, including a beautiful young boy with glasses in a gold gho earnestly worshiped. The descent was much faster, even with a quick stop for tea along the way, and we got to the bottom to find Namgyel, back from a quick trip to India, waiting. It was like greeting an old friend. 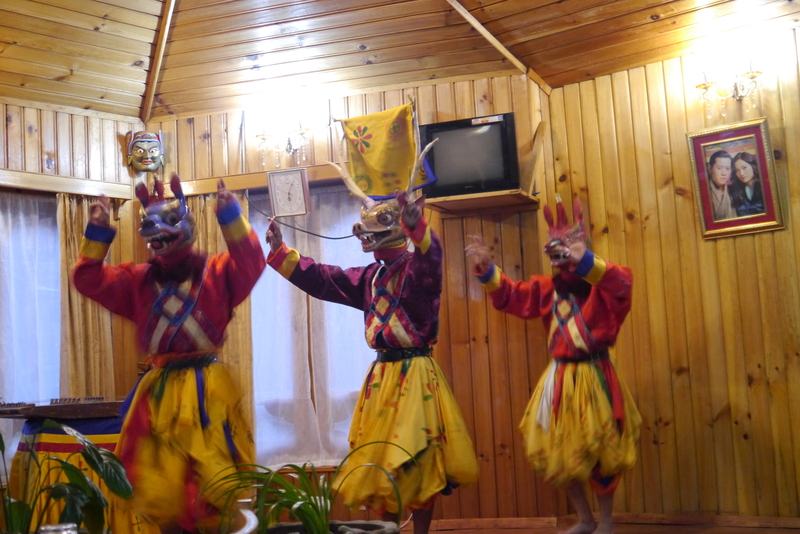 He drove us back to the guesthouse where we had our final meal together and then Gembo offered his final surprise, a culture show. Performers in elaborate costumes shared cultural heritage through song and dance and even got us up dancing. After the show, our group attempted a wrap up session, but it was the least successful initiative we undertook on the trip. Too many emotions, thoughts, ideas, feelings swirled and the energy was too solemn. Overwhelming gratitude to our hosts clouded our ability to rationally analyze the important elements of the trip and to lighten up and just talk. At least that’s how I felt. We said goodnight and turned our attention to the mundane tasks of packing for our departure, reasoning that for a reflective bunch such as us, the meaning would reveal when it did. Despite continual togetherness for eleven days, we never really established the true impetus for the generous invitation and treatment we received on this journey. Gembo told us on our first night together that learning other traditions equips you with a way to see your own culture. That Bhutan has the desire to slow down the process of modernization and to maintain the culture, tradition, way of living and whatever is possible of the values and the goodness that Bhutan has as it modernizes. To do so well, they need right intervention and good decisions in their leadership. Values must be in the heart of any good decision maker. A perpetual student and curious to a fault, Gembo reasoned that experienced teachers of Christianity can link values and teach as well as learn from each other so as to eventually walk on same path, aligned. Gembo, Sabina and Namgyel took us to the airport the following morning. We bid farewell with promises to keep in touch, hearts heavy with gratitude for the experience of a lifetime. While we all went to Bhutan for our own reasons, collectively something big happened. The group is just now getting around to putting thoughts on paper in a much more reflective way than mine. Returning to the beginning of the journey, I can only offer that the essence of an artichoke is its heart, and is fiercely protected. It isn’t immediately obvious and takes hard work to reach. Whoever was the first to discover the sweet reward of an artichoke must have been wise and persistent; patient, purposeful and resolute. All qualities I hope I gained a little on this journey. The deepest and most profound moments and stories of our trip are like that artichoke, protected, and hidden deep within…for now. I will write them, maybe for a book one day and only at the grace and agreement of those involved. For now I hope that these tales give you some of those tasty morsels on the outside and a desire to dig deeper with me, eventually, to the heart. To Gembo and Sabina, all I can say is “Name same kadin chhe.” Thank you beyond the sky and earth. Next What do you like to do? 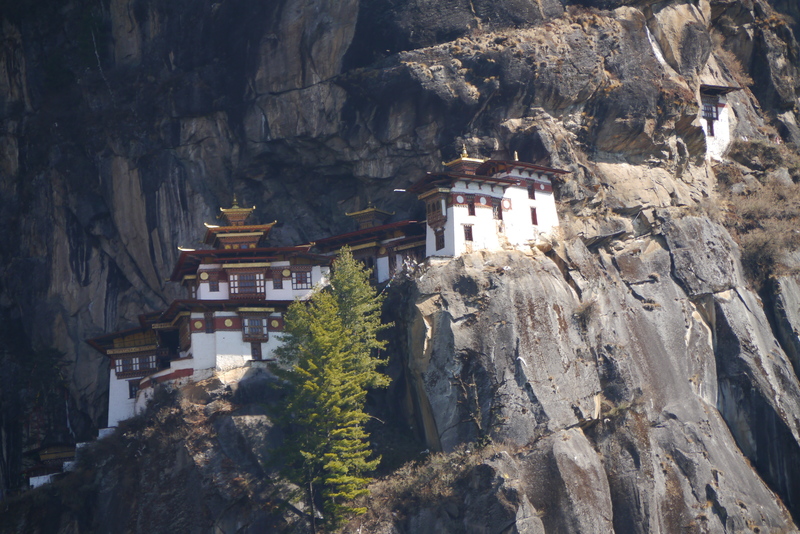 Amazing information regarding Bhutan. Happy to see those before my trip.